Hi there! The satellite of Saturn Titan has hydrocarbon seas, i.e. lakes made of liquid ethane and methane. When you have a sea, or a lake, you may have tides, and this is what this study is about. I present you A numerical study of tides in Titan’s northern seas, Kraken and Ligeia Maria, by David Vincent, Özgür Karatekin, Jonathan Lambrechts, Ralph D. Lorenz, Véronique Dehant, and Éric Deleersnijder, which has recently been accepted for publication in Icarus. The presence of hydrocarbons in such a thick atmosphere as the one of Titan has suggested since the spacecraft Voyager 1 than methane and ethane could exist in the liquid state on the surface of Titan. There could even be a cycle of methane, as there is a hydrological cycle on Earth, in which the liquid methane on the surface feeds the clouds of gaseous methane in the atmosphere, and conversely. I present you only the detected lakes with a diameter larger than 100 km, but some have been detected with a diameter as small as 6 km. It appears that these lakes are located at high latitudes, i.e. in the polar regions. Moreover, there is an obvious North-South asymmetry, i.e. there are much more lakes in the Northern hemisphere than in the Southern one. This could be due to the circulation of clouds of Titan: they would form near the equator, from the evaporation of liquid hydrocarbons, and migrate to the poles, where they would precipitate (i.e. rain) into lakes. Let us now focus on the largest two seas, i.e. Kraken and Ligeia Maria. Kraken and Ligeia Maria are two adjacent seas, which are connected by a strait, named Trevize Fretum, which permit liquid exchanges. Kraken is composed of two basins, named Kraken 1 (north) and Kraken 2 (south), which are connected by a strait named Seldon Fretum, which dimensions are similar to the strait of Gibraltar, between Morocco and Spain. Alike the Moon and Sun which raise tides on our seas, Saturn raises tides on the lakes. These tides cannot be measured yet, but they can be simulated, and this is what the authors did. In a previous study, they had simulated the tides on Ontario Lacus. They honestly admit that the tides on Kraken and Ligeia Maria have already been simulated by other authors. Here, they use a more efficient technique, i.e. which uses less computational resources, and get consistent results. Computational fluid dynamics, often referred as CFD, is far from an easy task. The reason is that the dynamics of fluids in ruled by non-linear partial derivative equations like the famous Navier-Stokes, i.e. equations which depend on several variables, like the time, the temperature, the location (i.e. where are you exactly on the lake? ), etc. Moreover, they depend on several parameters, some of them being barely constrained. We accurately know the gravitational tidal torque due to Saturn, however we have many uncertainties on the elasticity of the crust of Titan, on the geometry of the coast, on the bathymetry, i.e. the bottom of the seas. So, several sets of parameters have to be considered, for which numerical simulations should be run. It is classical to use a finite element method for problems of CFD (Computational Fluid Dynamics, remember?). This consists to model the seas not as continuous domains, but as a mesh of finite elements, here triangular, on which the equations are defined. The structure of the mesh is critical. A first, maybe intuitive, approach would be to consider finite elements of equal size, but it appears that this way of integrating the equations is computationally expensive and could be optimized. Actually, the behavior of the fluid is very sensitive to the location close to the coasts, but much less in the middle of the seas. In other words, the mesh needs to be tighter at the coasts. The authors built an appropriate mesh, which is unstructured and follow the so-called Galerkin method, which adapts the mesh to the equations. The authors then integrated the equations with their homemade SLIM software, for Second-generation Louvain-la-Neuve Ice-ocean Model. The city of Louvain-la-Neuve hosts the French speaking Belgian University Université Catholique de Louvain, where most of this study has been conducted. The model SLIM has been originally built for hydrology, to model the behavior of fluids on Earth, and its simulations have been successfully confronted to terrain measurements. It thus makes sense to use it for modeling the behavior of liquid hydrocarbons on Titan. In this study, the authors used the 2-dimensional shallow water equations, which are depth-integrated. In other words, they directly simulated the surface rather than the whole volume of the seas, which of course requires much less computation time. Let us now see their results. The authors simulated the tides over 150 Titan days. A Titan day is 15.95 days long, which is the orbital period of Titan around Saturn. During this period, the distance Titan-Saturn varies between 1,186,680 and 1,257,060 km because the orbit of Titan is eccentric, and so does the intensity of the tidal torque. This intensity also varies because of the obliquity of Titan, i.e. the tilt of its rotation axis, which is 0.3°. Because of these two quantities, we have a period of variation of 15.95 days, and its harmonics, i.e. half the period, a third of the period, etc. It appeared from the simulations that the 15.95-d response is by far the dominant one, except at some specific locations where the tides cancel out (amphidromic points). The highest tides are 0.29 m and 0.14 m in Kraken and Ligeia, respectively. Higher responses could have been expected in case of resonances between eigenmodes of the fluids, i.e. natural frequencies of oscillations, and the excitation frequencies due to the gravitational action of Saturn. It actually appeared that the eigenmodes, which have been computed by SLIM, have much shorter periods than the Titan day, which prevents any significant resonance. The author did not consider the whole motion of Titan around Saturn, in particular the neglected planetary perturbations, which would have induced additional exciting modes. Anyway, the corresponding periods would have been much longer than the Titan day, and would not have excited any resonance. They would just have given the annual variations of tides, with a period of 29.4 years, which is the orbital period of Saturn around the Sun. SLIM permits to trace fluid particles, which reveals the fluid exchanges between the basins. Because of their narrow geometry, the straits are places where the currents are the strongest, i.e. 0.3 m/s in Seldon Fretum. The volumetric exchanges are 3 times stronger between Kraken 1 and Kraken 2 than between Kraken and Ligeia. These exchanges behave as an oscillator, i.e. they are periodic with respect to the Titan day. As a consequence, there is a strong correlation between the volume of Kraken 1, and the one of Kraken 2. Anyway, these exchanges are weak with respect to the volume of the basins. The authors studied the influence of the response with respect to different parameters: the bathymetry of the seas (i.e., the geometry of the bottom), the influence of bottom friction, the depth of Trevize Fretum, and the attenuation factor γ2, which represents the viscoelastic response of the surface of Titan to the tidal excitation. It appears that γ2 plays a key role. Actually, the maximum tidal range is an increasing function of the attenuation, and in Seldon and Trevize Fretum, the maximum velocities behave as a square root of γ2. It thus affects the fluid exchanges. Moreover, these exchanges are also affected by the depth of Trevize Fretum, which is barely constrained. Another mission to Titan is needed to better constrain these parameters! and the one of Éric Deleersnijder. And that’s it for today! Please do not forget to comment. You can also subscribe to the RSS feed, and follow me on Twitter and Facebook. And let me wish you a healthy and happy year 2018. Hi there! Titan may be the most famous satellite in the Solar System, I realize that I never devoted a post to it. It is high time to make it so. 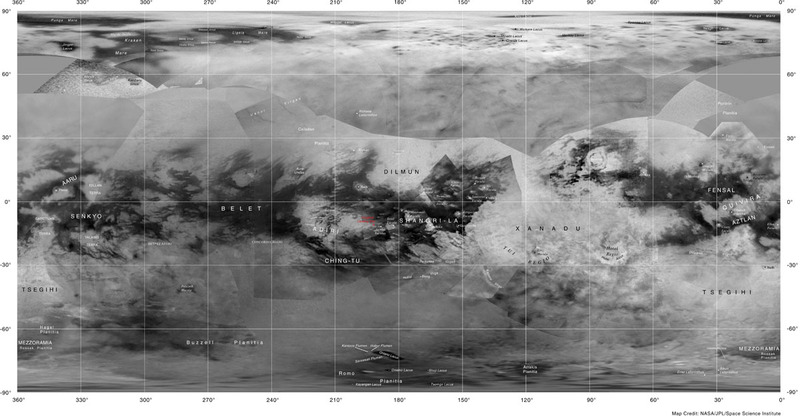 I present you Does Titan’s long-wavelength topography contain information about subsurface ocean dynamics? by Jakub Kvorka, Ondřej Čadek, Gabriel Tobie & Gaël Choblet, which has recently been accepted for publication in Icarus. This paper tries to understand the mechanisms responsible for the location of the boundary between the icy crust and the subsurface ocean. This affects the thickness of the crust, which itself affects the topography of Titan. The existence of Titan is known since 1655 thanks to the Dutch astronomer Christiaan Huygens. It was the only known satellite of Saturn until the discovery of Iapetus in 1671. It is the second largest natural satellite of the Solar System (mean radius: 2,575 km), and it orbits Saturn in almost 16 days, on a 3% eccentric and almost equatorial orbit (actually, a small tilt is due to the gravitational influence of the Sun). A thick atmosphere (pressure at the surface: 1.5 bar) mainly composed of nitrogen, with clouds of methane and ethane. A complex surface. We can find hydrocarbon seas, i.e. lakes of methane and ethane (Kraken Mare, Ontario Lacus…), we also have a mountain chain, which features have been named after Tolkien’s Lords of the Rings (Gandalf Colles, Erebor Mons,…). There are some impact craters as well, but not that many, which suggests a geologically young surface. There is probably cryovolcanism on Titan, i.e. eruptions of volatile elements. The surface and the atmosphere interact, i.e. there are exchange between the liquid methane and ethane of the lakes and the gaseous ones present in the atmosphere, and the atmosphere is responsible for erosion of the surface, for winds which are likely to create dunes, and for heat exchanges. A global subsurface ocean, lying under the icy crust. An internal, water ocean is considered to be of high interest for habitability, i.e. we cannot exclude the presence of bacteriological life in such an environment. This makes Titan one of the priority targets for future investigations. The rotation of the surface of Titan is synchronous, i.e. Titan shows on average the same face to Saturn, like our Moon, but with a significant obliquity (0.3°), which could reveal the presence of a global ocean which would decouple the rotation of the crust from the one of the core. A Schumann resonance, i.e. an electromagnetic signal, has been detected by the lander Huygens in the atmosphere of Titan, during its fall. This could be due to an excitation of a magnetic field by a global conductive layer, i.e. a global subsurface ocean. The gravitational Love number k2, which gives the amplitude of the response of the gravity field of Titan to the variations of the gravitational attraction of Saturn, is too large to be explained by a fully solid Titan. All of these clues have convinced almost all of the scientific community that Titan has a global subsurface ocean. Determining its depth, thickness, composition,… is another story. In the study I present you today, the authors tried to elucidate the connection between its depth and the surface topography. The authors tried to determine the depth of the melting point of the water ice with respect to the latitude and longitude. This phase boundary is the thickness of the icy crust. For that, they wrote down the equations governing the viscoelastic deformation of the crust, its thermal evolution, and the motion of the boundary. These deformations and excitations are responsible for variations of the temperature, which are also ruled by physical properties of the material (density, thermal conductivity), and which will determine whether the water should be solid or liquid. As a consequence, they will induce a motion of the phase change boundary. The equations ruling the variables of the problem are complex, in particular because they are coupled. Moreover, we should not forget that the density, thickness, temperature, resulting heat flows… not only depend on time, but also on where you are on the surface of Titan, i.e. the latitude and the longitude. To consider the couplings between the different surface elements, the authors did not use a finite-element modeling, but a spectral method instead. The idea is to consider that the deformation of the crust is the sum of periodic deformations, with respect to the longitude and latitude. The basic shape is a sphere (order 0). If you want to be a little more accurate, you say that Titan is triaxial (order 2). And if you want to be more accurate, you introduce higher orders, which would induce bulges at non equatorial latitudes, north-south asymmetries for odd orders, etc. It is classical to decompose the tidal potential under a spectral form, and the authors succeeded to solve the equations of the problem in writing down the variables as sums of spherical harmonics. And the main result is that the grain size of the ice plays a major role. In particular, the comparison between the resulting topography and the one measured by the Cassini mission up to the 3rd order shows that we need grains larger than 10 mm to be consistent with the observations. The authors reached an equilibrium in at the most 10 Myr, i.e. the crust is shaped in a few million years. They also addressed the influence of other parameters, like the rigidity of the ice, but with much less significant outcomes. Basically, the location of the melting / crystallization boundary is ruled by the grain size. Every new study is another step forward. Others will follow. At least two directions can be expected. The authors honestly admit that the presence of other compounds in the ocean, like ammonia, is not considered here. Adding such compounds could affect the behavior of the ocean and the phase boundary. This would require at least one additional parameter, i.e. the fraction of ammonia. But the methodology presented here would still be valid, and additional studies would be incremental improvements of this one. A possible implication of these results is the ocean dynamics, which is pretty difficult to model. Another step forward could come from new data. Recently the mission proposal Dragonfly has been selected as a finalist by the NASA’s New Frontiers program. It would be a rotorcraft lander on Titan. Being selected as a finalist is a financial encouragement to refine and mature the concept within the year 2018, before final decision in July 2019 (see video below). and the one of Gaël Choblet.